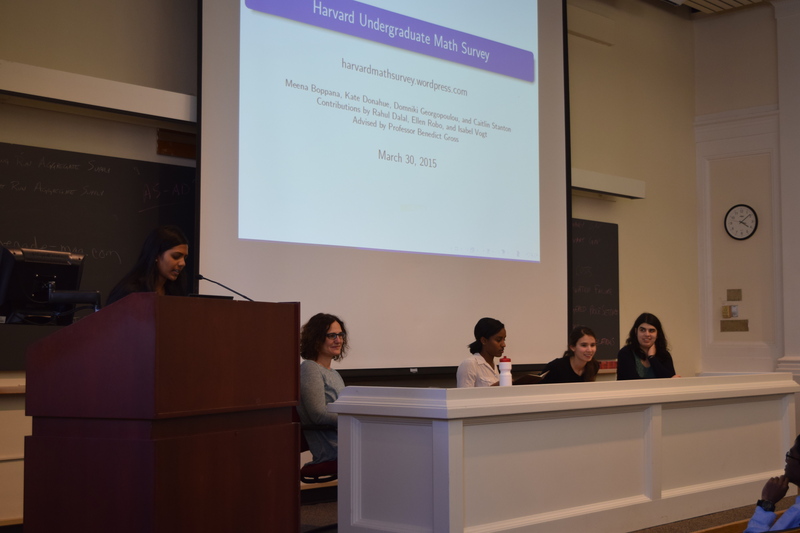 A panel to begin discussion of the gender gap in math within Harvard in response to the survey was organized by co-presidents Meena Boppana and Vikram Sundar and project co-chair Cherie Hu. The panel consisted of Prof. Gigliola Staffilani, a professor of mathematics at MIT, Rediet Adebe, a graduate student at Harvard in computer science, Hilary Finucane, a graduate student at MIT in math, and Alison Miller, a Benjamin Peirce fellow in the Harvard math department; it was moderated by Prof. Sarah Richardson, professor of the social sciences at Harvard. Around 150 students attended and the event was covered in the Crimson here.